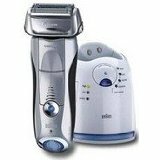 An electric shaver is a great tool for any man who wants to look good but doesn’t have a lot of time to spend on daily grooming. It’s also a good choice if you need to shave more than once a day or just don’t like to be tied to the bathroom sink. Carefully chosen electric shavers for men will provide as close a shave as a traditional razor and save you from throwing away money on expensive disposable blades, but the number of electric shavers on the market can make choosing one a challenge. The models reviewed here are the best of the best. All are safe, easy to use, and dependable. The first five are wet/dry shavers that can be used in or out of the shower. Special features of each model are highlighted below. 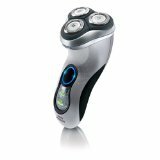 The Panasonic Vortex Wet/Dry Electric Shaver has an innovative design for a superb shave every time. It has a pivoting, adjustable head and three arced foil blades. Also featured are a pop-up trimmer and a digital battery charge monitor. What makes the Vortex truly unique, though, is its “Hydraclean” cleaning stand which cleans the razor, lubricates the blades, then heats the razor head dry. 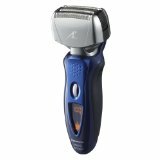 Like the Arc III, Panasonic’s Arc IV electric shavers for men provides a smooth, comfortable shave, an easy to hold design, a pop-up trimmer, and the convenience of a quick-charge rechargeable battery. The main difference between the Arc III and Arc IV is that the ARC IV does not include the Arc III Vortex’s “Hydraclean” system. 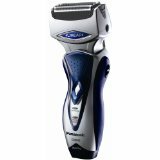 Panasonic is a trusted name in men’s electric shavers, and the Pro-Curve Wet/Dry lives up to that name. Its angled head pivots for a close shave, and its two foil blades and center slit float independently to catch and cut without pulling. Also features an LCD battery display to let you know when it’s time to recharge. Similar in design and function to the ES7103K reviewed above, this model features an upgraded linear motor for 13,000 revolutions per minute. Opt up to the ES8103S if you have a heavier beard and need the extra power. With three independently floating blade foils, you can expect a close, one-pass shave without any pulling, in or out of the shower. 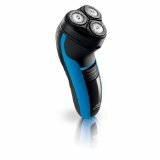 This shaver is fully charged in one hour, and has a battery indicator so you know when it’s time to re-charge. Every great electric shaver provides a close shave without cutting or pulling, but the Braun Series 7 has a power comb that lifts hairs lying flat to the face for a neat shave without the need for multiple passes. While on the high end of the scale, price-wise, its “clean and renew system” stand lets you press one button to clean, lubricate, then dry the blades and recharge the battery, and a fast clean mode cleans the razor in just 25 seconds. Also features an auto-adjusting voltage regulator for the international traveler. The Braun 7- 760cc is virtually identical to the 7- 790cc, making it powerful, easy to use, and effective. Its lower price tag reflects the 7- 760’s lack of the 25-second fast clean mode found in the higher-priced model. The Norelco’s rounded triangular head houses three independently floating blade heads with slots to cut longer hairs and holes to catch and lift shorter stubble. 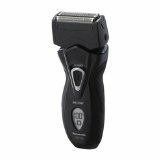 The Norelco is rechargeable and can provide up to 17 shaves on a single hour’s charge. Includes an LED indicator that shows battery status at a glance. Trimmings are captured inside the unit. The Philips Norelco Arcitec’s three independently flexing head units on a pivoting triangular head will hug the shape of your face and neck. A bonus trimmer extends out from the shaver’s body for trimming your goatee, moustache, or sideburns. 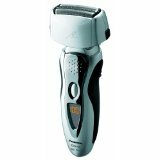 This shaver’s collection chamber draws trimmings inside the unit for easy clean-up, and an auto voltage adjust makes it a good choice for international travelers. 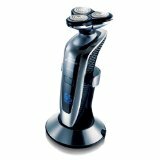 As one of the more expensive of the non-wet/dry shavers, the unit’s only drawback is its price. 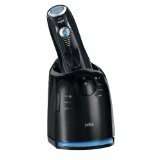 Exceedingly affordable and well-designed, the Philips Reflex Action is a great choice for budget minded shoppers who don’t want to compromise on performance. Three individually-floating heads follow the contours of your face. The two-blade lift and cut design dedicates one blade to lifting while the other blade cuts. This unit is corded and must be plugged in—a definite limitation—but its performance earns high marks.